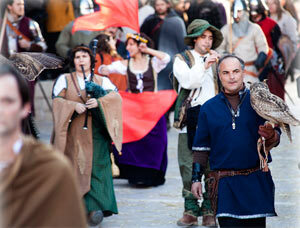 Coinciding with the arrival of the Carnival, Chinchón backs in time and the medieval seizes its streets and Plaza. Since 2004, the issue of Chinchon's Medieval Market is a success with no doubt, contributing to the Carnival live in a very different and special way. Organized by the "Arco Iris" Cultural Association and the collaboration of the City Council of Chinchón, this characteristic Medieval Market is held year after year, becoming a cultural landmark of the southeast area of Madrid. We can enjoy artisans, period music, dinner and dancing, crafts, jugglers, falconry and a host of entertainment and activities of the contemporaries. You can also taste traditional dishes of our gastronomy, such as garlic soup, crumbs, etc.. And a good chocolate to warm ourselves. This celebration commemorates one of the visits the Catholic Monarchs made to Chinchón, to visit their large and loyal friends Marqués de Moya, Andrés de Cabrera and Beatriz de Bobadilla, Lords of Chinchon. 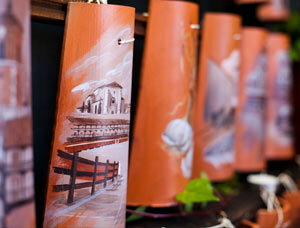 Represented by villagers, is one of the most characteristic acts in Medieval Market programme. From the City Council of Chinchón we invite you to travel through time and make your first stop in the town of Chinchón, where a pleasant surprise awaits and where you can also discover our heritage that supports this significant festival with its history and traditions. © 2007-2016, City of Chinchón. All rights reserved.